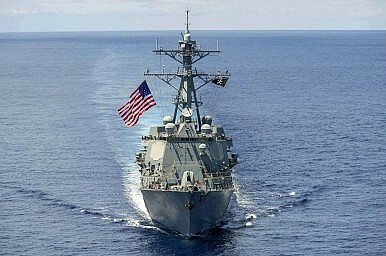 The Arleigh Burke-class guided-missile destroyer USS Kidd (DDG 100) underway in the South China Sea. There’s still time to pursue options that eschew both war posturing and unreciprocated conciliation. The unifying theme of U.S. Asia policy has been the maintenance of a stable, liberal regional order. Yet a number of regional trends now militate against that goal: trust among regional neighbors is low; military modernization investments are rampant; territorial nationalism is growing in salience; and China continues to press its peripheral claims in ways that risk inadvertent conflict. The current configuration of U.S. policy does nothing to arrest any of these problems, yet their continuation threatens longstanding U.S. interests in Asia. So what can be done? Today, there’s still time to pursue options that eschew either war posturing on the one hand or unreciprocated conciliation on the other. The first option to shape better future conditions without either appeasement or war is to significantly enhance the military capabilities of China’s potential adversaries. The most likely conflict scenarios with China run through a U.S. ally or partner — Japan, Taiwan, Vietnam, or the Philippines, for example. One of the background conditions that makes these conflicts plausible is an extreme capability asymmetry between China and its potential opponent. If the balance of local military capabilities favors China so strongly, U.S. allies and partners may be discouraged from contesting Chinese preferences when faced with the prospect of coercion. Improving the military strength of local allies and partners enhances general deterrence by simultaneously making the weaker states more capable of defending themselves while discouraging any coercive opportunism by Beijing. The goal is not for these smaller states to achieve military parity with China — that would be impossible and probably undesirable — but rather to mount a reasonable self-defense effort sufficient to bolster their confidence and induce a modicum of caution in Beijing. Another option is to render the Asian security environment as operationally transparent as possible. Strategic transparency — that is, certainty about the intentions of others — is an almost insurmountable problem in international relations; there’s more to say on that subject another day. At the operational level though, a much greater degree of transparency in Asia is both possible and necessary. Having situational awareness of who is doing what and when provides a basis for responsible (and sometimes collective) decision-making. China’s use of “gray zone” coercion in the South China Sea exploits ambiguities to maintain a “thin veil of deniability” about the fact of aggression, which undermines regional consensus-building against it. Enhancing regional transparency reduces opportunities for accidents and misunderstandings at sea, and makes it harder for China to present smaller states with coercive faits accompli (as in the 2012 Scarborough Shoal incident). Transparency also makes it easier for the region to distinguish aggressors from defenders when incidents do occur, which promotes stability by discouraging aggressive behavior (because the instigator will get caught) and improving the odds that smaller states band together to condemn (or balance) the aggressor. The United States might therefore focus on building national maritime domain awareness capabilities for Asian partners, which it has already started doing in the Philippines and Indonesia. The announced deployment of a P-8 surveillance aircraft to Singapore was also a step in the right direction, but a drop in the bucket. As the United States brings greater ISR capability to the region — such as the future deployment of MQ-4C Triton reconnaissance UAVs in 2017 — it needs to find ways to push the information it collects out to a larger network of allies and partners; transparency’s value is limited if only the United States has it. A third option is really a variant of the first: build select ally and partner capabilities to support anti-access strategies. Similar to but distinct from what some describe as a “hedgehog” strategy, this is not so much a way to change China’s calculus — a Sisyphean task if ever there was one — as it is a way to enable smaller powers to plausibly come out on top in a localized skirmish. China may retain escalation dominance in the abstract, but conflicts are not abstractions, and the ability of smaller powers to quickly secure their objectives in a localized operation flips China’s “gray zone” calculation on its head by presenting China with a fait accompli rather than the reverse. Implementing an anti-access capacity-building strategy isn’t easy. The United States has proven it has the stomach for some of what’s necessary — extending maritime domain awareness capabilities, missile defense, and surface patrol/combatant ships to select allies and partners. But these are half-measures. Also essential are undersea mine inventories and deployment doctrine, submarines, cruise missiles, and unmanned systems with various range and payload capacities. These capabilities, in turn, require loosening some of the political-legal constraints on foreign military sales and financing cases to countries like Vietnam. Most importantly, it requires a reform of the Missile Technology Control Regime (MTCR), which currently constrains the transfer of the most capable types of missiles and UAVs. Some may see these strategies as too modest or inadequate, occupying some mealy-mouthed middle ground that won’t change the direction of the region. Perhaps, but that’s because it attempts to eschew serious risk-taking at the extremes of appeasement or conflict. Eliminate the riskiest options, and you’re probably going to be left with things that are sub-optimal but that allow you to avoid dramatic near-term trade-offs. Others may see these strategies as too risky. Arming the region seems like a recipe for feeding undesirable security dilemmas. Technology and information transfers may compromise either the U.S. industrial base or the sources and methods of U.S. intelligence. And reforms to MTCR might undermine arms control as we know it. But any decision involves risks and trade-offs, and if you’re presented with a strategy that involves neither, then you’re not getting an honest presentation. Moreover, the decision to do nothing different in U.S. policy will have pernicious consequences for regional stability, to say nothing of future U.S. standing in the region. Asian governments are arming with or without the United States. China is encroaching on the interests of others even if the United States maintains credible alliance commitments and an active military presence. And the prevailing U.S. approach to nonproliferation — by controlling the supply of a given technology — is a poor fit with modern trends in which technological advances derive less from secret government-funded facilities than from from commercial innovation. All three strategies chart a middle (and indirect) way of dealing with competition and regional insecurity trends. They’re also compatible with one another. And any of the three offers the prospect of handing future presidents a more flexible hand in managing Asia policy. Achieving that requires policymakers to raise their gaze from the shortsighted present. But if they care about peace and not just politics, that must be the standard to which they aspire. The views expressed belong to the author and do not necessarily reflect those of the Department of Defense, DKI-APCSS, or U.S. Government. Regional trends converging with longstanding flashpoints make conflict more likely.